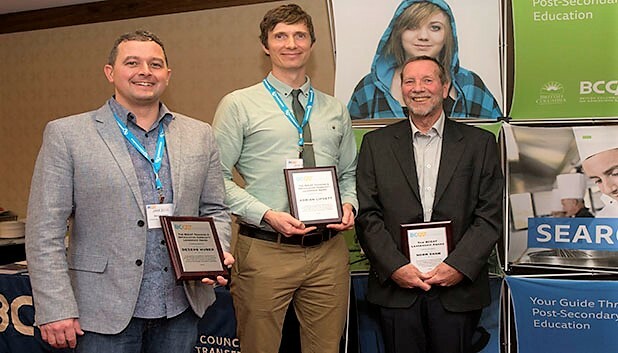 Richard (Rick) Chester, Faculty of Forest and Natural Areas Management (FNAM) at BCIT, has received the 2018 BC Council on Admissions & Transfer (BCCAT) Leadership Award joint with Norm Shaw, former BCIT Instructor and Association of BC Forest Professionals (ABCFP). This award is presented in recognition of exemplary leadership having a significant and positive impact on advancing the theory and practice of transfer and articulation within the BC Transfer System. 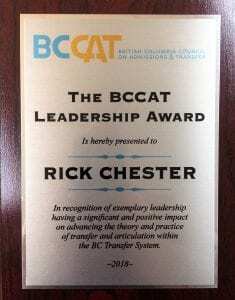 BCIT Faculty Richard (Rick) Chester is recognized for his exemplary leadership and positive impact on advancing the theory and practice of transfer and articulation within the BC Transfer System. Instead of attending the BCCAT awards ceremony at the Pinnacle Harbourfront Hotel in Vancouver, Rick went on a field trip to Chilliwack to assist students and faculty who needed his support. Ed Morrice, Instructor at College of New Caledonia, is one of many that have witnessed Rick and Norm’s dedication to the industry. In 2005, Rick and Norm began working on a comprehensive database of all forestry competency outcomes delivered by technical schools in BC. They had a vision to start this process at the Forestry Articulation meeting held at the Pallisades Centre in Jasper at what is known as the Jasper Accord. Rick and Norm have spent thousands of hours, mostly volunteer building and refining this tool for use by Forestry schools and the professional forestry group to assess programs and individual transfer (without funding and on their own initiative). They have demonstrated leadership in the area of transfer in BC and have created an important legacy. Their work received recognition from the Forestry and Sustainable Resources Management Articulation Committee as it supports the articulation committee in addition to finding utility with external organizations. Eat. Sleep. Study for finals. Congratulations! Nice to see you have been recognized for your excellent work and dedication.